The use of bow and arrow, whether for the hunt or for war, dates back to prehistory, but in relation to the English its heyday came with the widespread use of the longbow from around the mid 13th to the later 15th centuries. 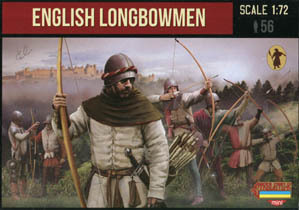 During this period the English longbowman achieved great fame for the destruction he could cause on a battlefield, and in particular by the way the longbow could defeat the cream of European knighthood, which had largely dominated the battlefield up to that point. At battles such as Crecy (1346), Poitiers (1356) and Agincourt (1415) they contributed greatly to remarkable victories against what many considered enormous odds, and helped change the emphasis in European warfare from the heavily-armoured mounted knight to the organised infantryman. Although the importance of the archer is sometimes exaggerated, to the point that men-at-arms are barely even considered, their impact was considerable throughout the above period, and by the Wars of the Roses English armies had anything up to six times as many archers as other infantry, when at the start of the period their proportions might have been about even. So it is perhaps surprising that this is the first time that a set exclusively dedicated to archers has been produced. Previous sets (listed below) have included a few archers, but never really in appropriate numbers relative to the rest. This Strelets set however has the luxury of providing a generous 14 poses, so as you would hope there is a wide range, inevitably including several at more-or-less full draw, a couple yet to begin the draw, some reaching for a new arrow, and a few in more relaxed pose. Of the poses ready to loose their arrow, we thought all were pretty good. All have drawn to about the chin, which is reasonable, and happily all have the arrow on the left side of the bow. Two are aiming horizontally, and no one is aiming anything like as high as is commonly seen in films, though those that do aim higher are suitably leaning back to do so. Naturally horizontal shooting means they are aiming at short range rather than at maximum range, and it has been argued that this was very common, since of course this is always the most effective method. So despite some celluloid representations these poses are all fine. The two poses with arrow loaded but yet to draw are good too, though one man (last figure in second row) is holding his bow horizontally, so clearly is not tightly packed and has the room to do so. The four men reaching for an arrow include another holding the bow horizontally, which just leaves the three 'miscellaneous' poses. One (row one, figure four) seems to hold several arrows by the head, perhaps tucking or untucking them in his belt (a bit awkward), while a second (bottom row, first figure) looks to be very relaxed and stands with hand resting on some arrows planted in the ground (as with any soldier, much of a battle would be just standing and waiting). The last of the miscellaneous poses is the man to his left, who is holding up two fingers of his right hand. Although these fingers are not parted in a 'V' arrangement, we might speculate that this pose relates to the myth that English archers used to taunt their French opponents by showing that they still had the fingers to draw their bow, when the French had declared they would cut these off any archer they caught. Unfortunately that popular myth has absolutely no actual evidence, which is a bit of a shame, and it does leave us scrambling for reasons to use this figure. However perhaps in this case the colourful story is worth the figure, even if not technically likely. The bows all look pretty good, generally being a little longer than the archer himself, which is perfect, and the arrows are good too. However things go awry when it comes to the manner of containing those arrows, because no less than 10 of the poses seem to have a rigid, and very thin, quiver. At this sort of period arrows would be carried on the man using lose cloth quivers - almost bags - which might have a central or bottom device to keep the arrows apart and in place. These might open at the top, or from both ends, but they were roughly cylindrical and apart from those with a wooden frame they would be soft and irregular in shape. No one here has such a device, which is a real pity. Three of the poses have arrows tucked into a waist belt, which was very common practice, and one man has placed his arrows in the ground, which is also authentic. Like the rest of the army, the English archer wore what we could afford, scrounge, loot or otherwise choose, so a wide range of clothing styles is necessary and that is what we have here. Many have a soft jacket or tunic (usually called a gambeson or jack), which would provide good protection in itself, but would often have some metal or other form of armour inside or underneath. Many look to be quilted, and the various designs look fine. Some men have pieces of mail, which again is accurate, one has some sort of scale armour and another has a complete breastplate. These last two would have been fairly unusual, but worth inclusion here. Everyone here has unarmoured legs, so just hose and shoes or short boots, though even here occasional armour would have been reasonable. Many wear a simple hood with a short cape - standard working man’s costume - but several have a helmet, mostly simple in design and perhaps either metal or cuir-bouilli (hardened leather). There are no sallets here, which helps to keep the suitable period as long as possible, though more sophisticated helmets like this would have been increasingly common in the late medieval period. Although steps were taken to protect them, archers knew they could find themselves face-to-face with the enemy, and would have to defend themselves, as well as possibly engage in fighting simply because the supply of arrows was exhausted, so all would have had a secondary weapon. The majority here have a sword, generally a straight blade of probably indifferent quality, but there are a couple of falchions too. Some have a visible knife, but all probably had one somewhere about their person. One man has an axe as a second weapon, and another has a maul (a sort of war hammer), while two of the swordsmen also have the small round shield known as a buckler, so all good on the weapons front. The sculpting is very good, with none of the rather chunky profile we are used to seeing in Strelets sets. The detail is well done and generally of the correct size, which again is not usual in past Strelets output. You can see small things like the bracer every man wears on his left wrist, which is not always particularly sharp but still pretty good. The two horizontal bows are a struggle to get into the ring hands, so a little filing is needed there, but there is no other assembly. Flash is almost non-existent, and the poses are well chosen to avoid any unwanted plastic. We debated whether to give the sculpting a score of 8 or 9 (8.5 felt right), but settled on a very creditable 9. By the late 15th century gunpowder weapons were improving to the extent that archery grew less and less important. As the 16th century progressed the archer largely disappeared from English armies, though on the sea the longbow would still have an important role to play for many decades more. As a representation of the English longbow in its heyday we liked this set very much. The good number of poses allows for a satisfyingly varied range, and while there might be occasions where a figure aiming at long range might be useful, there are no particularly obvious missing ones here. The sculpting is very acceptable - an impressive improvement for this manufacturer - and accuracy is generally good though significantly marred by the thin and rigid quivers so many of the figures have. Although that is a serious problem, it is about the only one in an otherwise impressive set.